During the colonial period, Georgia counties were divided into "Militia Districts" for the purpose of organizing a military company to defend the area from Indian raids or other threats. This practice continued after the Revolution, and as new counties were formed, new Militia Districts were created within their boundaries.
" District residents often elected a Captain who promised not to hold muster days! The Militia system was abandoned during the Civil War period, but the district boundaries remain intact and retain their function as political subdivisions. Aside from providing a military company, Militia Districts were used as divisions for census enumeration, voting and taxation (Georgia taxpayers are still divided by GMD today). making it a challenge to determine which district is which when studying these records. The list below, compiled by Wayne Tiller, shows the Captains' name for each district for several years, which can be a tremendous help when studying Census and Tax Lists. If you have additional information to add to this list, please contact Jeanne Arguelles. Notes: 1800 census was used to match names. 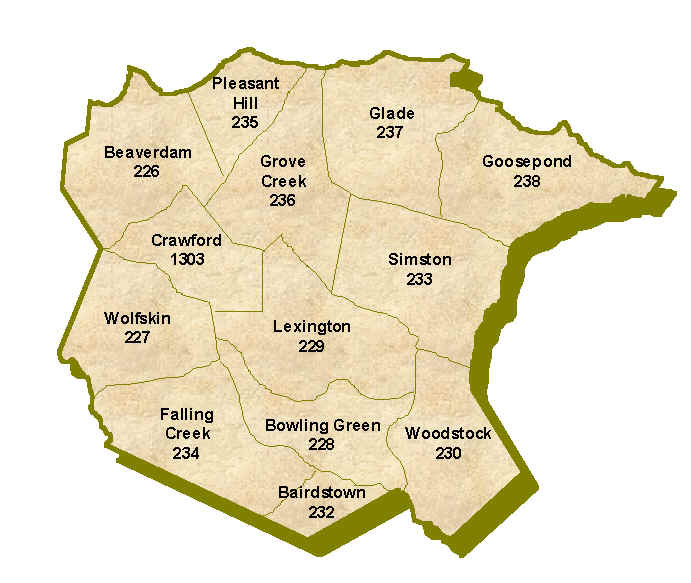 Districts 11 and 13 may represent part of the county that became part of Greene County. People are not in 1800 Oglethorpe Census. A Digest of General Tax in Oglethorpe County for the present year this 28th of June 1801. Certified by John Gresham for Radford Ellis R.T.R.O.C. Certified 12th day of August 1802 by John Gresham Sen R.T.T.O.C. Certified this 26th of September 1803. John Gresham Sen. R.T.R.O.C. Following notes on right side border of page for named districts. ** Fishing Creek Academites part morallised the rest get drunk run in debt can't pay go to jail breakout and run away. Certified this 22 day of July 1805. John Gresham Sen. R.T.R.O.C. Notes: Elias Beall, Joseph Hubbard and William Bailey were listed at the top of the page in their respective districts but Little B. Kennebrew, John Kidd and John G. Smith were listed in the final totals at the end of the years listing. Notes: Not listed on the totals at the end of the year but listed at the top of each page in the Grove Creek area is Capt. Taliver Berry. Notes: John Gresham Sen. was replaced by Gresham L. Rakestraw as the R.T.R.O.C. (County Tax Recorder) after 1813. The order of recording the districts changed as did the spelling of some names, i.e., Goldsby became Goolsby, Nowell became Noell, Davenport became Devenport, etc. Notes: In 1816 Gresham L. Rakestraw was replaced by John Baughan as RTROC. LDS Microfilm #177700 contains the contents of two Oglethorpe County Tax Digest books for 1816-1819 and 1820-1824. The LDS microfilm for 1833 is extremely hard to read. Pass was listed at the top of the page for Goosepond Dist. but Eades was listed at the end of that district. 4, 5, 7 and 8 are a guess.